A recent market study published by PMR– “fibrinogen testing reagents Market: Global Industry Analysis 2013-2017 & Forecast, 2018-2028” consists of a comprehensive assessment of the most important market dynamics. On conducting a thorough research of the historic as well as current growth parameters of the fibrinogen testing reagents market, the growth prospects are obtained with maximum precision. The fibrinogen testing reagents market report features the unique and salient factors that are likely to significantly impact the development of the fibrinogen testing reagents market during the forecast period. It can help market players to modify their manufacturing and marketing strategies to envisage maximum growth in the fibrinogen testing reagents market in the upcoming years. The report provides detailed information about the current and future growth prospects of the fibrinogen testing reagents market in the most comprehensive manner for the better understanding of readers. The fibrinogen testing reagents market report commences with an executive summary of the key findings and key statistics of the fibrinogen testing reagents market. It also includes the market value (US$ million) estimates of the leading segments of the fibrinogen testing reagents market. Readers can find detailed taxonomy and the definition of the fibrinogen testing reagents market in this chapter, which helps understand the basic information about the fibrinogen testing reagents. This section also highlights the inclusions and exclusions, which helps the reader understand the scope of the fibrinogen testing reagents market report. This section explains about the key trends followed by the manufacturer and consumer in fibrinogen testing reagents market. This section helps reader to understand the both supply-side and demand-side trend impacting the growth of fibrinogen testing reagents market. This chapter highlights the key success factors of the fibrinogen testing reagents market report, which include regional scenario of coagulation disorders, key regulation and unique marketing strategies followed by the manufacturers. This section highlights the average price of Q.F.A. thrombin kits, multifibren U reagent, STA-fibrinogen kits, fibrinogen kits, and imidazole buffer kits in the different region throughout the globe. The pricing benchmark for manufacturer level pricing and distributor level pricing is analysed in this section. This section explain the global market analysis and forecast for the fibrinogen testing reagents market. It also highlights the incremental opportunity for the fibrinogen testing reagents market along with the absolute dollar opportunity for every year between the forecast period of 2018-2028. This chapter explains the key macro-economic factors that are expected to influence the growth of the fibrinogen testing reagents market over the forecast period. Along with macroeconomic factors, this section also highlights the opportunity analysis for the fibrinogen testing reagents market. This chapter also highlights the key dynamics of the fibrinogen testing reagents market, which include the drivers and restraints. Based on the reagent type, the fibrinogen testing reagents market is segmented as Q.F.A. thrombin kits, multifibren U reagent, STA-fibrinogen kits, fibrinogen kits, and imidazole buffer kits. In this chapter, readers can find a detailed analysis of the fibrinogen testing reagents market by different reagent types and their expected growth over the forecast period. Based on the indication, the fibrinogen testing reagents market is segmented as congenital fibrinogen disorders, fibrinogen storage disease, hereditary fibrinogenα-chain amyloidosis, acquired dysfibrinogenemia, cryofibrinogenemia, disseminated intravascular coagulation, end-stage liver disease. This section helps readers understand the penetration of different indication in the fibrinogen testing reagents market over the forecast period. Based on the end user, the fibrinogen testing reagents market is segmented as hospitals, clinics, diagnostic laboratories, ambulatory care centers, academic & research institutes. In this chapter, readers can understand the market attractive analysis based on the end user. This chapter explains how the fibrinogen testing reagents market will grow across various geographic regions such as North America, Latin America, Europe, East Asia, South Asia, Oceania and the Middle East & Africa (MEA). This chapter includes a detailed analysis of the growth of the North America fibrinogen testing reagents market along with a country-wise assessment, which includes the U.S. and Canada. Readers can also find the key takeaways of this region, and market growth based on reagent type, indication, end user and country of fibrinogen testing reagents in the North America region. This chapter contains a snapshot of the Latin America fibrinogen testing reagents market. It includes the growth prospects of the fibrinogen testing reagents market in the leading LATAM countries such as Brazil, Mexico, Argentina and the rest of the Latin America region. The important growth prospects of the fibrinogen testing reagents market based on i reagent type, indication, end user in several European countries, such as the U.K., Germany, France, Italy, Spain, Russia and the rest of Western Europe, is included in this chapter. This chapter highlights the growth of the fibrinogen testing reagents market in Eastern Europe by focusing on China, Japan and South Korea. This section also helps readers understand the key factors that are responsible for the growth of the fibrinogen testing reagents market in East Asia. India, Indonesia, Thailand, Malaysia are the leading countries in the South Asia region that are the prime subjects of assessment to obtain the growth prospects of the South Asia fibrinogen testing reagents market in this chapter. Readers can find detailed information about the growth parameters of the South Asia fibrinogen testing reagents market during the period 2018-2028. Readers can find important factors that can significantly impact the growth of the fibrinogen testing reagents market in Australia and New Zealand during the forecast period based on the market segmentation. This chapter provides information about the growth of the fibrinogen testing reagents market in the major countries of the MEA region, such as GCC Countries and South Africa, during the period 2018-2028. This section explains the tier structure for global fibrinogen testing reagents market which helps reader to understand the percent share of market cover by tier 1, tier 2, and tier 3 players in the fibrinogen testing reagents market. This section also explains the company share analysis for fibrinogen testing reagents market which helps readers to understand the market share taken by key players available in the market. In this chapter, readers can find a comprehensive list of all the leading manufacturers in the fibrinogen testing reagents market, along with detailed information about each company, which includes the company overview, revenue shares, strategic overview, and recent company developments. Some of the players featured in the fibrinogen testing reagents market report are Siemens Healthcare GmbH, Thermo Fisher Scientific Inc., Grifols S.A., Helena Laboratories Corporation, Diagnostica Stago S.A.S., Tulip Diagnostics (P) Ltd., and Werfen. This chapter helps readers understand the research methodology followed to obtain various conclusions and important qualitative information & quantitative information about the fibrinogen testing reagents market. Anticoagulant therapy includes various conventional drugs as well as new oral rapid-acting drugs that are used by patients, annually, to treat various conditions such as deep vein thrombosis, pulmonary embolism, and genetic clotting disorders. Just to screen the efficiency of anticoagulants, consistent blood tests such as fibrinogen, PT, and D-dimer are done through coagulation analyzers. The treatment needs to be monitored regularly, and is usually recorded in an anticoagulant therapy record book. The dosage of the anticoagulant drug is recommended depending upon the blood monitoring results. This is anticipated to propel the growth of the global fibrinogen testing reagents market during the forecast period. According to a study published in Nature Review, deep vein thrombosis, a blood clotting disorder, is the major cause for mortality and morbidity in Europe. The incidence rate of this disease is around 104 to 183 per 100,000, per year, in Europe. The high incidence rate of this disorder is a major factor that is projected to drive the growth of the fibrinogen testing reagents market during the forecast period. Furthermore, high health care expenditure and new entrants in the region are the other factors that are contributing to the growth of the fibrinogen testing reagents market in this region. Also, the assurance of patient safety due to the trending use of disposable consumables and reliable results are attributed to the growth of the fibrinogen testing reagents market in Europe. The high adoption rate of automated and technological advanced coagulation instruments and reagents, high demand for faster results, and spontaneous testing are also projected to drive the growth of the fibrinogen testing reagents market during the forecast period in the region. Also, the increasing privatization of diagnostic laboratories, value-added services, and user convenience are likely to fuel the growth of the fibrinogen testing reagents market during the forecast period. There has been a gradual increase in the number of manufacturers of fibrinogen testing reagents who are investing in the Asia Pacific region. Moreover, the vulnerable population and high unmet diagnostic needs have gathered more market attention. Asia Pacific is one of the fastest developing regions for fibrinogen testing reagents. Factors such as high per capita income, increased disposable income, and improving healthcare infrastructure uplift the growth of the fibrinogen testing reagents market. Regional factors are responsible for the increased consumption of diagnostic and therapy products. An increasing number of diagnostic labs and point of care testing in countries such as Saudi Arabia and South Africa is expected to boost the growth of the MEA fibrinogen testing reagents market over the forecast period. Bleeding disorders account for a significant share of various diseases in developing countries. A study published in the Blood Journal in 2013 stated that, in a few developing countries in the Middle East such as Iran, consanguineous marriages are high, and the prevalence of bleeding disorders is also high. Many studies have shown that, around 60% to 70% of deep vein thrombosis is clinically undiagnosed in developing countries. End stage liver disease is taking a huge toll on the present population, and with the presently adopted lifestyles, the disease is projected to increase, creating an impact on the fibrinogen testing reagents market. Lack of awareness in developing countries (China, India, and others) is expected to hinder the growth of the global fibrinogen testing reagents market. 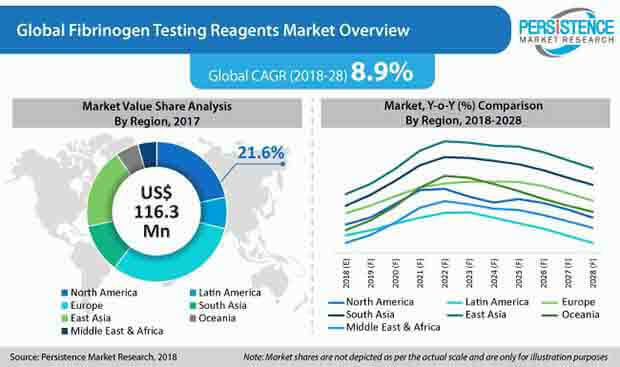 Affordability issues in China and India are expected to create a dip in the overall market value potential, and such a scenario may hamper the growth of the overall fibrinogen testing reagents market during the forecast period. The competition section of the report features the profiles of the key players in the fibrinogen testing reagents market based on their product offerings, market shares, marketing approach, and differential strategies. Some of the key players profiled include Siemens Healthcare GmbH, Thermo Fisher Scientific Inc., Grifols S.A., Helena Laboratories Corporation, Diagnostica Stago S.A.S., Tulip Diagnostics (P) Ltd., and Werfen. Fibrinogens are plasma proteins that are synthesized in the parenchymal tissue of the liver. Fibrinogen testing reagents are assay kits that are used in the quantitative determination of various hemorrhagic states or disorders in a clinical laboratory setting. PMR has conducted a research study on the fibrinogen testing reagents market for the forecast period 2018 to 2028. The report offers a comprehensive evaluation of the business opportunities prevailing in the fibrinogen testing reagents market, along with insights on key regulations, prevalence data, and pricing. The report also elaborates on the macro-economic factors influencing the dynamics of the fibrinogen testing reagents market. The report offers a comprehensive taxonomy of the fibrinogen testing reagents market based on reagent type, indication, end user, and region. By reagent type, the fibrinogen testing reagents market is segmented as Q.F.A. thrombin kits, multifibren U reagents, STA-fibrinogen kits, fibrinogen kits, and imidazole buffer kits. Based on indication, the fibrinogen testing reagents market is segmented as congenital fibrinogen disorders, fibrinogen storage diseases, hereditary fibrinogenα-chain amyloidosis, acquired dysfibrinogenemia, cryofibrinogenemia, disseminated intravascular coagulation, and end-stage liver disease. On the basis of end user, the fibrinogen testing reagents market is segmented as hospitals, clinics, diagnostic laboratories, ambulatory care centers, and academic & research institutes. The fibrinogen testing reagents market has been analysed across the regions of North America, Latin America, Europe, East Asia, South Asia, Oceania, and MEA. What is the revenue potential of fibrinogen testing reagents across the countries of North America and Europe? Who are the key competitors in the fibrinogen testing reagents market, and what are their product portfolios and growth strategies? What are the major factors influencing the growth of the fibrinogen testing reagents market? Which trends are being followed by the leading manufacturers of fibrinogen testing reagents to retain their market share.